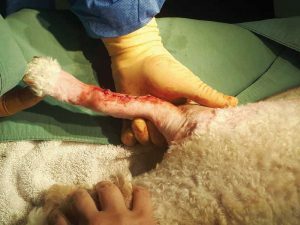 The surgical treatment of limb deformities in dogs has historically been approached by taking preoperative measurements using radiographic orthogonal views. When calculations for the osteotomy location, hardware type, and size were determined, the information was transferred to the patient in the operating theatre. Although using this procedure can result in satisfactory outcomes, there are many cases involving severe deformities where preoperative planning can be very difficult. Having a 3D model closely approximating the actual limb can significantly benefit the presurgical plan. 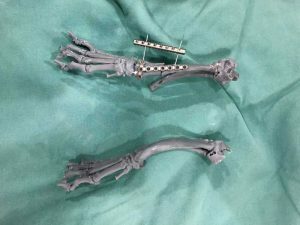 Three-dimensional printing is proving to be a very useful technique in veterinary orthopedic applications, particularly as it relates to preoperative planning. Production of multiple models that are scaled on a one-to-one ratio to the patient can allow the surgeon to accurately plan surgical procedures. Using these techniques for preoperative planning can provide several benefits, including lessening time under anesthesia and lowering its associated risks, as well as decreasing surgical site infection. Although it is expensive, the cost of employing 3D printing can be justified when considering the benefit of shorter surgeries, less anesthetic time, and facilitating more consistent results in order to avoid subsequent revision surgeries. In the majority of cases, the use of 3D modelling is decided upon by owners and offered as an alternative method in preparation for surgery. Due to improved 3D printers and materials, models can replicate bones very closely. This is important, as the sensation of cutting and placing implants on the models must mimic the real thing to improve the final outcome. Models for some extremities may be too large to be printed in-house, in which case, an external source can be used. Keep in mind, these external services can be expensive and cost-prohibitive for some cases. Having a 3D model closely approximating the actual limb can significantly benefit the preoperative plan. Consider Buddy, a four-year-old castrated male havanese cross. He presented with a severe angular limb deformity (ALD) to our surgical service. It was determined the dog had a right front antebrachial deformity that rendered him with a significant lameness. The angular deformity is described as right front radial procurvatum, with external torsional and distal antebrachial valgus. Normally, we use orthogonal radiographs with specific radiographic positioning to determine the anatomical and mechanical axis with which to pinpoint the centre of rotation angle (CORA). Orthogonal radiographs were performed on the limb, although a CORA was difficult to ascertain from the X-rays. Due to the challenge of determining the anatomical and mechanical axis from the extreme defects in the radius and ulna, CT imaging was performed. Specific computer software was used to determine the cross-sectional imaging to generate 3D views and to further manipulate the limb in question. The software allowed us to determine correction of angulation and rotation as it was simulated on the screen. A model was then created using a 3D printer and a specially formulated resin that closely represents real bone when cured. A closed-wedge osteotomy in oblique angle was performed on the model, which resulted in an anatomically aligned radius and ulna. A jig was manufactured to be used intra-operatively. The implants were contoured to the new configuration, and preplacement of implants allowed us to have an exact match preoperatively. The implants and jig were then sterilized to be used on the patient intra-operatively. The patient was placed in ventral recumbency with the limb in position to allow for a cranial lateral incision over the osteotomy site. We were able to use a more minimally invasive technique due to the predetermined osteotomy site. Our 3D bone model allowed us to reduce the size of the incision significantly. a reduction of surgical time. After dissection and separation of the musculotendinous structures over the osteotomy site, the osteotomy was performed. The bone was aligned and the precontoured plate was placed. The area was lavaged and sutured in three layers, and the limb was given a bivalve Dynacast to be worn for two weeks. Preoperative planning saved significant time in the OR and operating theatre, reducing the anesthetic time significantly for this patient. This technique also allowed us to minimize the patient’s morbidity by providing faster healing time and less disruption of periosteal blood supply. Physical models created from CT for treatment planning and visualization provide a number of distinct advantages. Computer-generated images of 3D structures on a two-dimensional screen can create uncertainty in depth and orientation for the surgeon. Successful surgical correction of deformities, such as congenital angular limb abnormalities, requires accurate characterisation of anatomical deviations in planning of a corrective osteotomy. A hands-on approach can give the surgeon improved visual perception, so he or she is better able to recognize depth and orientation by handling and manipulating the 3D model. Within the orthopedic surgery field, 3D printing enables prior testing of a surgical procedure, leading to improved outcome and a reduction of surgical time. 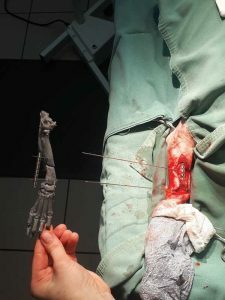 Three-dimensional-printed models can be a useful tool for teaching and training novice surgeons and subsequently improving the accuracy of the procedure. John Brajkovich, B.Sc., DVM, MACVSc (SA surgery), holds a bachelor of science from the University of Guelph, and received his doctor of veterinary medicine degree from Ontario Veterinary College (OVC) in 2000. Dr. Brajkovich has had extensive orthopedic training at Ohio State University and successfully completed and became a member of the Australian New Zealand College of Veterinary Scientists (ANZCVS) in small-animal surgery in 2016. He currently has a surgical practice in Caledon, Ont. He has been an instructor for many orthopedic training courses for veterinarians across the province. Brajkovich is currently working on several studies based on the technological advancements in veterinary orthopedic surgery.